Bronson is a film for those who enjoy artistic violence and dark comedy. 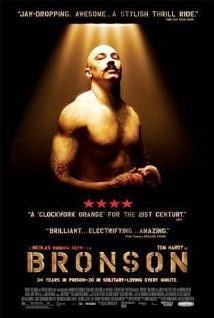 If you find yourself naming "Fight Club", "A Clockwork Orange", "Trainspotting", or any Quinten Tarantino film as among your favorites, you should definitely give Bronson a try. Tom Hardy ("Inception", "The Dark Knight Rises") plays Michael Peterson, who at the tender age of 19, finds himself wanting more than what life is ultimately offering. So he cuts down a shotgun and robs a post office, semi-successfully. Ultimately, he is caught, arrested, and sentenced to 7 years in prison. Unfortunately for the young Michael, his dreams of grandeur land him in even more trouble as he continues to try and buck the system. His aggressive and violent nature condemns him to spend the next 34 years behind bars. 30 of those years, in solitary confinement. The film is narrated by Hardy as Charles Bronson, the name and personality that Peterson assumes in his time spent bare knuckle fighting while enjoying a short time outside of prison in his 69 days of freedom in 1988. Bronson would then spend his time creatively capturing the hearts of all with his eclectic theater performances as well as his uncanny ability to smother butter over his naked body to make it harder for the guards to wrestle him to the ground when he is feeling a bit frisky and violent. The film itself is actually based on a real inmate in Europe named Charles Slavador, born Michael Gordon Peterson, whom the press dubbed "The most violent prisoner in Britain". Salvador robbed the post office in 1974, he has been incarcerated pretty much ever since. He is currently being housed at Wakefield Prison as of this review in 2014.